This piece from McKinsey is a perfect example of how digital age thinking and technology can and will and are disrupting traditional systems, such as banking. It demonstrates the possibilities of this age and as Blockchain becomes more entrenched it is both an exciting time for creating value but also dangerous for those firms who do not see digital transformation as a priority. The story of Kodak is both poignant and relevant. It is time for the Boardroom to decide! Here are two compelling pieces to bring further insights for your organizations’ digital transformation. It is not about technology, but strategic thinking that will achieve this quantum leap! It is now an Imperative! Over the past year or so I have written extensively on the Digital Economy as a result of extensive secondary research. Whilst not being alarmist in any way, I now wish to advise you that it is an imperative which can no longer be ignored for business, society and government. It creates jobs, new lifestyles and new wealth across the divide of countries, economies and society. I have added this link for your consideration, as it demonstrates precisely the urgent need for your transition, and I share many of the views expressed. First to market always has the competive advantage in terms of leadership. I urge you to make this strategic leap forward! How the Digital Age and Economy have evolved. The Digital Economy has evolved from the rapid advancement of technology platforms constructed on the Internet. Having accommodated the Global Village though technological innovation in communications in the previous Industrial Age, the high speed transfer of data for managing performance became innovative in a data-driven world. Data was the new gold as phrases such as data-mining and data-warehousing became popular and provided opportunities for career advancement. Data analytics was seen as the fulcrum of the Industrial Age. However, Moore’s Law was in overdrive, and as innovation and creativity fired rapid growth of capacity, capability and technology, the data-driven age quickly transformed into a content driven one, the Fourth Industrial Revolution, The Digital Age and Economy. 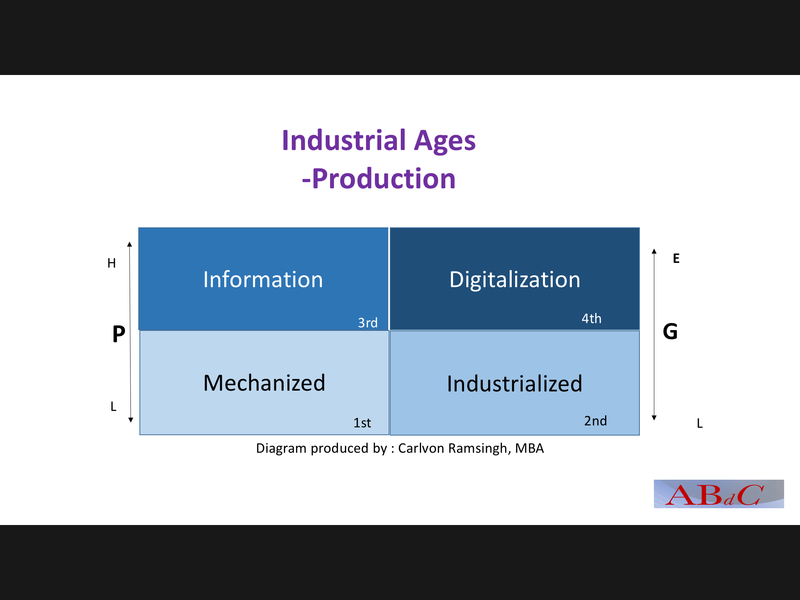 The diagram shows how the productive capacity, globally, has been affected as a result of the changes in Industrial Ages. “P ” represents the growth in Production from low to high. “G ” represents Growth from Linear to Exponential which can be measured both in financial and geo-spatial metrics. In a general sense, The First Industrial Age when the mother of all inventions occurred; the steam engine, production, relatively speaking, was increased greatly from a totally manual environment. The Second Industrial Age when electricity was invented, created the capacity to increase production even more, again generally speaking. With electricity, came digitization, the binary which was the ability to translate electric pulses into data. Computerization, in the Third Industrial Revolution, became a driver of mass production and mass customization. In the Fourth Industrial Revolution, the nuances must be identified to fully understand the enormous force that beacons. The difference between digitization and digitalization is in fact a progression in technology application. Digitization facilitated the capture of data, in a manner that will lend itself to the analysis of historic data for decision making, notwithstanding the speed at which it travels. Data had to be captured, processed, and reported. At the confluence of the 3rd and 4th Revolution this data became available realities, although that is subject to debate. However, at the very beginning of the 4th, the technology ad advance to such an extent that it is now possible to not only capture data, but it is now possible to make products using digitization. This is where the distinction between digitization and digitalization must be made. A product can now be made using digitization (the binary) into a product that can be consumed eg music, pictures, and made via a digitization process into a physical product(3D printing). Digitalization has more to do with product and services rather than data. Hence product and services can now be delivered electronically, hence the Digital Economy, The Fourth Industrial Revolution, the Digital Age!